Employment: When deciding whether you are a good candidate or not for the loan process, one thing lenders will definitely be looking at is your employment history. Do you work on commission, are you self-employed, or do you have gaps in your employment history? These common circumstances may be the reason you appear to be an undesirable loan candidate for lenders. When looking at your application, lenders are eager to see that you have a steady and reliable source of income. In fact, most lenders require that you have been at a job for at least 2 years or more to be applicable for the loan process. Although this varies depending on the lender, loan type, and extenuating circumstances, the bottom line is that you must appear stable and reliable to the lender. Having years’ worth of proper documentation to back up your income is especially important if you are self-employed, a seasonal worker, or work on commission. The more reliable one appears on their application applies directly to how little or how big of a risk you will appear to be for the lender. Credit Score: Another very important factor lenders will look at is your credit score/credit history. Your credit score helps to determine the rate and conditions you will receive on your loan, so having a good credit score shows lenders that you are a lower risk investment for them and that you will likely not have any difficulty paying your loan back. A higher credit score also allows you the opportunity to receive a lower rate on your loan with good conditions. However, if your credit score is low, lenders will feel that you are a riskier investment and may reject your application or accept with the conditions that you pay a higher interest rate. One must also remember that even if your credit score is high, a spouse’s low credit score could damage your chances of receiving a loan. According to credit.com, any score in the 700’s or above is excellent and anything below 660 could have some lenders turning you away. While qualifying credit score varies depending on the lender, loan type, and more, low credit scores are one of the most common reasons why mortgage loan applicants are rejected. Debt to Income Ratio: Debt to income ratio, or DTI, is also important to remember when applying for a loan. Debt to income ratio compares your monthly income to housing costs based on what your monthly mortgage payment would be. DTI also factors in any major pre-existing debts a person has such as student loans, credit card bills, and monthly car payments. Your DTI will be expressed as a percentage and the lower that percentage is, the more appealing you will be to lenders. According to Zillow, any DTI that is less than 36% is considered feasible for mortgage professionals and a 20% or lower DTI is considered as excellent. Anything beyond 36% may be a red flag to lenders. If you are concerned or would like to know your current DTI percentage, you may easily use a debt-to-income calculator online today. 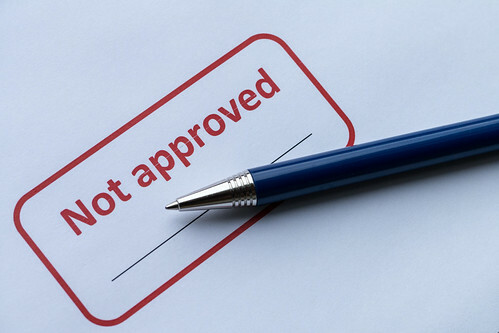 While borrower’s mistakes and unappealing financial backgrounds may have lenders turning them away, it is also possible that the borrower did not receive proper guidance from a certified mortgage professional. In many cases, inexperienced loan officers can decline your loan and wrongly turn you away leaving you feeling hopeless. Make sure that you are dealing with an experienced and licensed professional in the industry first to receive the best outcome, whatever your situation may be. Click here to contact an experienced mortgage professional today.